Regis University is spending $21 million on an expansion and face-lift of a 54-year-old residence hall. The university, located in northwest Denver, said this week that it will begin construction in April of a five-story, 39,600-square-foot addition to DeSmet Hall, a freshman dorm on campus. The addition will nearly double the size of the 50,000-square-foot building. Michael Redmond, who oversees the campus’ facilities, said Tuesday the existing building will get a makeover. The entire project is slated to be completed in July 2020. The four-story DeSmet Hall, built in 1964, houses 214 students and will receive upgrades on each floor, including new finishes in the bathrooms, new carpet and asbestos removal. 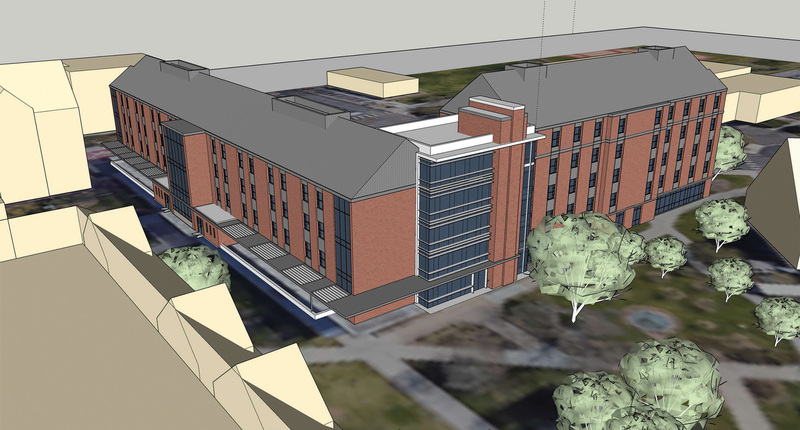 The addition to the southeast side of DeSmet Hall will make room for 104 new beds, four lounge areas for freshmen, three classrooms on the first floor and the building’s first elevator. “It’s going to be a multipurpose facility, so it’s living and learning,” Redmond said. Regis received $18 million in investment funding for the project and is using an additional $3 million from the university’s deferred maintenance funds. The university has hired the Beck Group to oversee construction and design of the new addition, with help from architecture firm KSQ Design. Coda Construction will complete the interior renovations of the existing building, Redmond said. The dorm’s namesake, Father Pierre DeSmet, was a Jesuit missionary for Native Americans during the 1800s. The residence hall is one of three traditional dorms at the university. Another on-campus housing option, the $8.1 million Boryla Apartments, opened to graduate and undergraduate students in 2018. Regis is also near completion of an $11 million renovation of its student center, Redmond said.